Treating seeds by soaking in water seems to stir up the life process. Like any living thing, a seed requires moisture, heat and oxygen. The moisture provided by you is absorbed through the seed coat. This results in a swelling of the seed parts and a quickening of vital activities. In other words, growth begins. Onions can be planted from starts or sets. The starts are just baby plants with stems and a bit of root. A set is an actual bulb and will produce onions quickly. You can plant onion sets without soaking them, but soaked onions will sprout more quickly. You can also soak onion seed before planting to encourage germination. Soaking the sets in compost tea will give them added nutrition and protection from disease. Fill a large bowl halfway with compost tea. Place the onion sets or seeds into the compost tea and let them remain there for up to 24 hours. Drain the water from the onions sets or seeds. Your seeds or bulbs are now hydrated so you can plant them now. 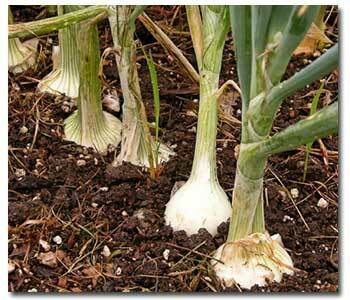 If planting onion sets or bulbs, till a garden bed with at least 2 inches of compost or planting mix. Onions grow best in fertile, well-draining soil. Dig holes 1 inch deep and place the soaked bulbs in with the roots down. Cover them with the newly amended soil and water until the top 3 to 4 inches of soil is moist. Plant rows at least 9 inches apart. Onion seed starting is easy. If starting from seed, plant ¼ inch deep in pre-filled trays for later transplant after seeds have germinated. Follow the steps above for transplanting onions sets. You can also sow seeds directly into the garden. Spread seeds in your prepared garden bed and cover & pat lightly with soil. Once the seedlings have begun to push through the soil, they can be thinned between 1 and 2 inches apart. After a couple of weeks, these can be further thinned out to every 4-5 inches. Another method, instead of thinning by removing plants, is to transplant the bulbs to another row. Be sure to plant the rows about 9 inches apart and bulbs between 4-5 inches apart. You would do this around January or as soon as plants are large enough, allowing them enough space to grow. Use drip irrigation or a soaker hose after they germinate. Water the onions daily for about 5 minutes. This method will deliver water to the roots and bulbs, leaving the foliage dry. This will help prevent disease and mold. Spray a dilution of fish emulsion on the foliage every two weeks according to package directions to protect and feed your onions.